Jared joined the nematology team at AgBiome in 2018. He is a native of Arizona where he attended The University of Arizona (Bear Down!) for his Bachelor’s (BS in Biology and BA in Spanish) and Master’s (PSM in Microbiology) degrees. During his time at U of A, he worked in a research lab studying entomopathogenic nematodes. From his time in Arizona, Jared developed a love for hiking, camping, and real Mexican food. 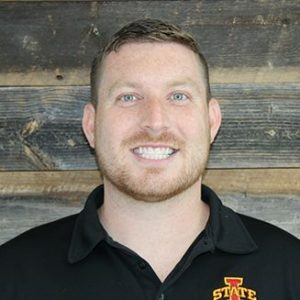 Jared continued on with his nematology career by obtaining a PhD in Plant Pathology from Iowa State University. Through his dissertation work, he developed new methods to study the biology of the soybean cyst nematode, and used those methods to analyze the effects of nematicidal seed treatments on nematode biology. Jared is an award-winning chef, winning awards for two different salsas and his chili (two-time Ames Main Street Farmers Market Salsa Contest champion and Ames Main Street Farmers Market Chili Cook-off champion). Its rumored that AgBiome only hired Jared because of his two adorable Labradors.